The president of the American Federation of Teachers recently issued a remarkable mea culpa. • What exactly should school cops do? For years, Randi Weingarten supported "zero-tolerance" policies in schools. Under zero tolerance, students who break certain school rules face mandatory penalties, including suspension and referral to law enforcement. The approach gained popularity during the 1980s, and by the mid-1990s, most school districts in the United States had adopted some form of zero tolerance. But at the end of 2015, Randi Weingarten wrote an editorial in American Educator saying those policies had been a failure. "When you see that you're wrong, you have to say that you're wrong and apologize for it," Weingarten said in an interview. Zero-tolerance policies were supposed to make schools safer and make discipline fair. But in practice, the policies "didn't help us get to the safe and welcoming school environments that every parent wants for his or her child," Weingarten said. Across the country, schools are moving away from zero tolerance and trying to reduce the number of students they're suspending. The turnaround is a response to a growing body of research showing that zero-tolerance policies resulted in a disproportionate number of kids of color suspended, expelled, and referred to law enforcement. Schools have little choice but to change. In 2014, the federal Departments of Education and Justice issued a letter to state education commissioners warning that districts continuing to have a pattern of disproportional discipline risk a federal civil rights action. Already, a number of districts around the country are facing complaints or have entered into settlements with the DOE's Office of Civil Rights. Many districts are struggling to figure out how to reduce suspensions and still maintain order in classrooms. In some places, teachers have been frustrated by new discipline policies that they say don't allow them to suspend students in many cases, but don't offer them other options for dealing with disruptive students. Weingarten said changes in discipline policies need to be accompanied by training and support for teachers. "We can't go from zero tolerance to zero discipline," she said. Some school districts are finding some success in reducing racial gaps in discipline and maintaining order by taking different approaches to discipline, such as restorative justice. In Denver, Tim Turley teaches teachers how to use restorative practices rather than removing kids from the classroom. He said he often meets with skepticism from teachers in his workshops. He reminds them that suspension is a temporary solution. They can remove a student, but "they always come back," Turley said. Turley said suspension is a hollow threat for most kids. "Kids who are suspended don't sit home and read the Bible to learn the errors of their ways," he said. "To them a suspension is a legal three- to five-day holiday." Research bears out Turley's observation. Recent studies show that suspension is ineffective at changing students' behavior and has serious long-term repercussions. "When you deny kids learning time they fall behind academically because they're not in school," said Pedro Noguera, a professor of education at UCLA. "Many times there's no provision to make up work you missed because you were in trouble. But, secondly, the longer you've been put out the more discouraged you become." A student who is suspended in the ninth grade — even just once — is twice as likely to drop out of school later. Students who are suspended are also more likely to wind up in the juvenile corrections system. "School disengagement is one of the strongest correlates of juvenile delinquency," said Russell Skiba, professor of counseling and educational psychology at Indiana University. Skiba said it's not just that kids who were headed for juvenile detention happen to get suspended on the way. It's that suspension itself appears to contribute to later trouble with the law. Take similar kids at similar schools who commit similar offenses. Suspend some but not others. The ones who are suspended are more likely to get suspended again, to drop out, and to get arrested. Skiba began looking into the effects of zero tolerance soon after President Bill Clinton signed the Gun-Free Schools Act in 1994. The act required states that get federal education money to pass zero-tolerance laws requiring the expulsion of any student who brought a weapon to school. But many states passed laws that went further, requiring suspension or expulsion for other offenses, too. Some school districts created zero-tolerance policies calling for suspension or expulsion for fighting, drugs, smoking, defiant behavior, tardiness and even truancy. "The theory was that by providing severe consequences to even minor infractions, it would send a message to students that disruptive behavior was unacceptable," Skiba said. But that thinking didn't make sense to Skiba. A tenet of behavioral psychology is that punishment alone can't shape appropriate behavior, he said. He and other researchers started looking at data from a large Midwestern school district, "and began to see some troubling patterns in that data," Skiba said. "Suspensions were being used for relatively minor behavior. The majority of suspensions were not for the most serious offenses but rather for more minor behaviors. And we began to see a huge racial gap." 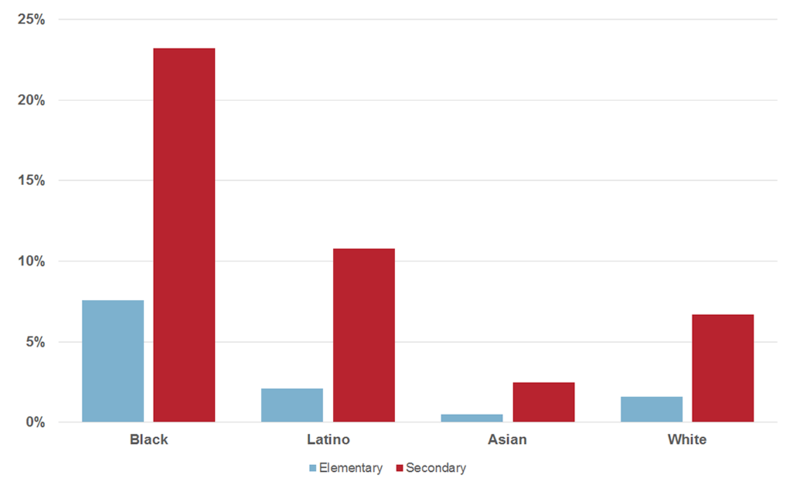 Kids of color were more likely to be suspended than white children. Skiba looked at other studies and found the same result. And Skiba said it wasn't because African American kids are more likely to act up in school. "We have not seen any evidence that African American students are engaged in higher rates of more serious behavior than other students in the same schools, in the same districts," Skiba said. "In fact what we found was that they seemed to be referred to the office more for subjective reasons than more objective reasons." Skiba says there's not much difference between black and white students when it comes to concrete offenses, such as bringing a weapon to school. But when the infraction is something that's in the eye of the beholder — something like loitering, disrespect, or threatening behavior — black students are more likely than white students to be suspended. Other researchers have found similar results. One study demonstrated that teachers' preconceptions about black and white students may be one reason for the disproportionate discipline. Researchers Jennifer Eberhardt and Jason Okonofua at Stanford University gave teachers a series of anecdotes about student misbehavior and asked whether the students should be punished. Different teachers got the same anecdotes, but the names were changed: Some teachers got a name that suggested that the child was white, like Greg or Jake. Others got a name that suggested that the child was African American, like DeShawn or Darnell. The teachers who got names like DeShawn and Darnell were more likely to suggest harsh discipline on a second offense and more likely to say they could imagine suspending the child in the future. 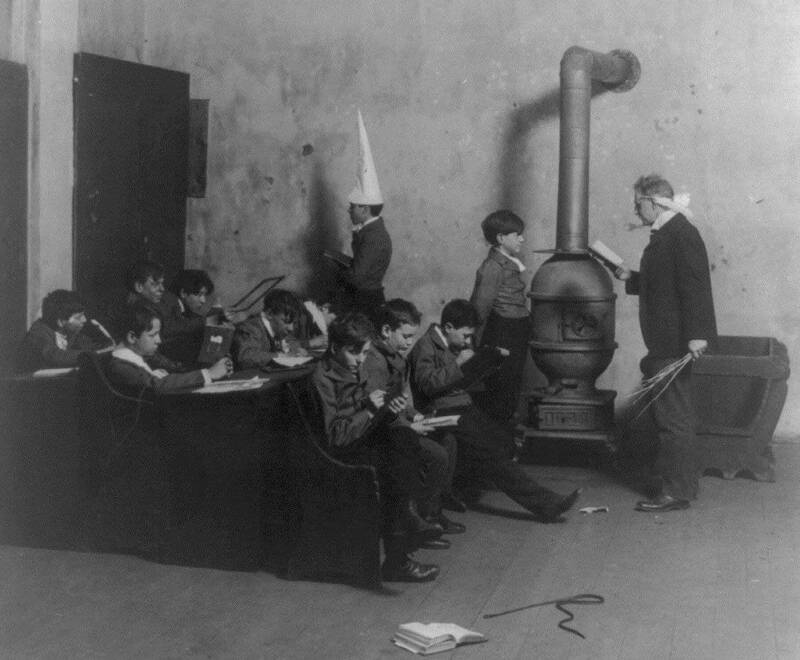 When zero-tolerance policies were first gaining popularity in the 1980s and 1990s, many people thought that strict, inflexible policies would result in fairer discipline. But the racial discipline gap got wider. 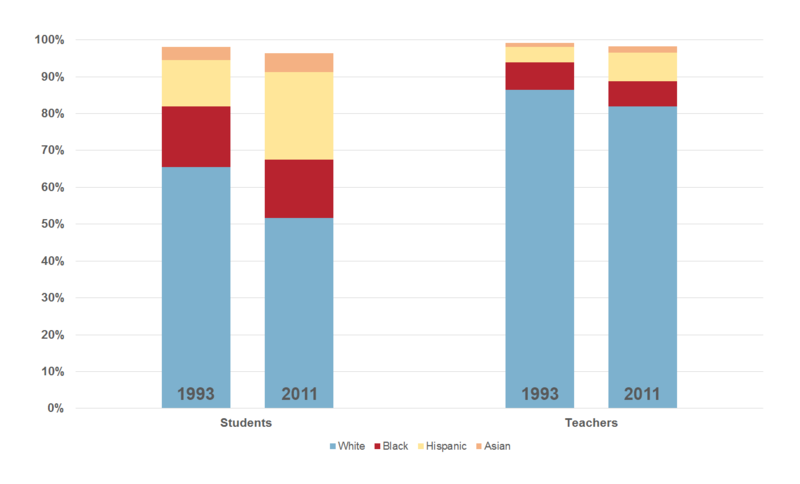 In the 1970s, a black child was twice as likely to be suspended as a white child. Today, a black child is nearly four times as likely to be suspended — even a preschool child. The other hope was that zero tolerance would make schools calmer and safer, but researchers say that didn't happen, either. An American Psychological Association task force issued a report on zero tolerance in 2008 that said, "Rather than reducing the likelihood of disruption ... school suspension in general appears to predict higher future rates of misbehavior and suspension among students who are suspended." The report also looked at the assumption that removing disruptive students would lead to a safer climate at school. "Although the assumption is strongly intuitive," the report said, "data on a number of indicators of school climate have shown the opposite effect, that is, that schools with higher rates of suspension and expulsion appear to have less satisfactory ratings of school climate." Weingarten said it was data like this that changed her thinking about school discipline. She argues that it will likely never be possible to get away from suspension and expulsion entirely. Students who are dangerous will always have to be removed from schools. But she says less serious misbehavior should be dealt with in other ways. "If we're only talking about suspension in discipline, we've lost our way," she said. Support for this program comes from the Spencer Foundation, Lumina Foundation and the Corporation for Public Broadcasting's American Graduate project.